An excess of cholesteryl esters, the storage product for excess cholesterol within cells, was shown to induce tau protein in neurons to form abnormal aggregates called neurofibrillary tangles that are characteristic of Alzheimer's disease. Previous studies have determined that predisposition to Alzheimer’s disease (AD) may arise from altered cholesterol metabolism, although the molecular pathways that may link cholesterol to AD phenotypes are only partially understood. 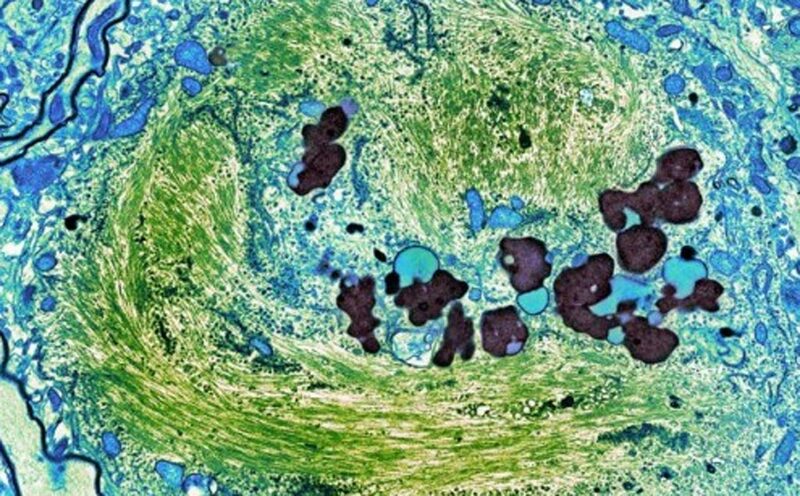 Image: A micrograph showing tangles of tau protein (green) in the brain cell of a person who had Alzheimer’s disease (Photo courtesy of Thomas Deerinck of the National Center for Microscopy and Imaging Research at the University of Califronia, San Diego School of Medicine). In this regard, investigators at the University of California, San Diego (USA) performed a phenotypic screen for phosphorylated tau (pTau) accumulation in AD-patient iPSC (induced pluripotent stem cell)-derived neurons, which carried mutations in the cholesterol-binding domain of (Amyloid precursor protein) APP or lacked APP altogether. The investigators reported in the January 24, 2019, online edition of the journal Cell Stem Cell that they had identified cholesteryl esters as upstream regulators of tau during early AD development. They also found that while cholesteryl esters regulated Abeta secretion, their effects on tau and Abeta were mediated by independent pathways. Efficacy and toxicity screening in iPSC-derived astrocytes and neurons showed that allosteric activation of the neuronal enzyme CYP46A1 lowered cholesteryl ester levels specifically in neurons and was well tolerated by astrocytes. Thus, cholesteryl esters were found to independently regulate tau and Abeta and could be reduced by a drug such as the anti-HIV drug efavirenz, which activates CYP46A1 and thereby reduces tau in AD-patient neurons.